Home > Resources > Recover Samsung > How to Recover Deleted Data from Samsung Tablet? It is common for a Samsung smartphone or tablet user to encounter data loss problem. As a phone owner, we usually stored a lot of important personal files, such as photos, videos, music, contacts, text messages and other data in the phone memory and we wish to protect them well, hoping we can keep them forever. However, what if they are lost due to various and unexpected situations and we want to recover deleted data from Samsung tablets or phones? No need to worry. Deleted files are still here in your Samsung device like Samsung Galaxy S9+/S9/S8+/S8/S7/S6/S5/S4, Samsung Galaxy Note 8/7/5/4, Samsung J3/J3 Pro, Samsung Galaxy A9/A8/A7/A5 and etc. 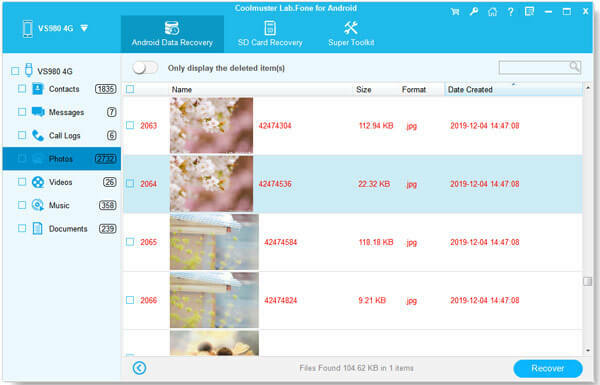 A professional Android data recovery program named Coolmuster Lab.Fone for Android is able to retrieve all the deleted data back. By three simple steps, you can easily use the program to scan, preview and recover all your lost photos, videos, music, apps, contacts, SMS messages, etc. Here is the free trial version. Now you can download it to have a try by yourself. Then, follow the steps below and check how to recover deleted data from Samsung tablet with the help of Coolmuster Lab.Fone for Android. Attention, stop using your Samsung tablet, or the new contents will be added to it and replace the deleted ones. If so, the lost files can never be found again. Run the downloaded and installed Android data recovery software. Connect your Samsung tablet to your computer via USB. Then, enable USB debugging on your tablet as follows. After that, this program can detect your tablet successfully. All lost files will be scanned and arranged on the left menu. Now you can enter these folders to preview your deleted data. After previewing, you can mark the files in whole or part according to your own requirement. After selecting all what you need, you can give a click on the "Recover" button from the button above. Then, you can set the output location for the recovered Samsung tablet files. Those lost files can be restored within minutes. Tips: In case the data lost again on your Samsung tablet, you'd better back up your Samsung tablet to computer from time to time with the help of Samsung Tablet Transfer.